The cleanup of the Hudson River by the General Electric Company — dredging industrial pollutants that have been poisoning the river for 60 years — finally started last year. That is the good news. The bad news is that the project turned out to be full of unexpected problems. This does not mean that the dredging of buried polychlorinated biphenyls, or PCBs, should be abandoned. It does mean that changes need to be made in the way the company and the Environmental Protection Agency, which is overseeing the project, tackle the second and much larger phase, scheduled to begin in May. A draft report last month from independent scientists hired by the agency identified several serious but not fatal problems in the first phase, which ran from May to November last year and removed almost 290,000 cubic yards of sediment. Contaminated layers of sediment were thicker than sampling probes had predicted. Dredges got hung up on debris, their jaws unable to seal in toxic contents. The volume of PCBs released into the water and air was far higher than expected. The panel said the dredgers needed better data on the location and concentration of the toxic sediment. It disagreed with G.E.’s suggestion of placing a limit on the mass of PCBs to be removed. That’s sensible: Nobody knows how much contamination is still in the river, and the company is under a binding agreement to remove it all. With that uncertainty in mind, the panel also recommended that the project’s five-year completion deadline be dropped. The E.P.A. now says the dredging might end up taking 10 years, which is fine. A job done slowly and right is better than one altered or abandoned. Fortunately, we will not have to wait until the job is completed to see good things happen. When PCB concentrations start falling in the river, they decline in fish. This means the benefits of the project will start being felt long before the last load of toxic mud is pulled up from the bottom. This is the strongest rebuttal to G.E.’s old argument that the answer is to let the carcinogens lie in the river, decaying on their own. If the cleanup of a river that has been tainted for 60 years and counting takes a few years longer than first planned, nobody should be complaining. The river would have been cleaner years ago if G.E. hadn’t thrown its full power at delaying what it was finally ordered by a court to do. But if it takes a few more years and dollars to get to a cleaner river, so be it. The federal Environmental Protection Agency faces a major decision next month: whether and how to proceed with the controversial Upper Hudson River dredging project, one of the largest environmental cleanups in US history. Will the EPA keep its promises to the public? Thus far, its record is poor. It promised to do the job in two phases -- and to pause after the first phase to judge its effectiveness, based on a set of strict scientific criteria. Yet it declared last summer's first phase a "resounding success" -- dismissing the inconvenient fact that dredging resulted in higher levels of PCBs in water, air and fish. The supposed point of dredging is to reduce PCB levels -- and the EPA went ahead with the project despite critics' warnings that it would instead increase them. * To keep the resuspension of PCBs during dredging to just 0.13 percent of the PCBS dredged. This is important because resuspension spreads contamination downstream, reducing the cleanup's effectiveness. In fact, dredging released 40 percent more PCBs to the lower Hudson than the EPA said it would allow. * That dredging would reduce PCBs in fish, even in the years when dredging was being performed. In fact, levels rose up to 400 percent. * The EPA promised dredging would last only five years -- thereby ensuring that it would be more beneficial than other cleanup strategies, and to "limit the duration of construction-related impacts." Later, the agency extended the schedule to six years. Now it says the project will take longer. Yet that extends the negative environmental impacts, and disruption of the river and the community -- with no offsetting benefit. * PCB levels in air also rose during dredging, exceeding the EPA's standard more than 100 times. Somehow, the EPA nonetheless concluded that the work proceeded "without having excessive resuspension or air emissions." Most troubling is the EPA's reversal on its commitment to limit the PCBs dispersed downstream. Rather than enforcing a strict limit and revamping the project to meet it, the agency has recommended tripling the PCBs that can flow into the Lower Hudson in Phase 2. Yet that would clearly exceed the level that the EPA itself has said would "deliver an unacceptably large mass of PCBs to the Lower Hudson." Somehow, the EPA now insists this PCB release will have no environmental impact. Huh? If PCBs are so harmless, why dredge in the first place? By any standard, the first phase of dredging was a failure. But rather than own up to the problems, the EPA is preparing to require an even larger project than it initially envisioned -- because, it says, the river's condition "disturbs the conscience." Perhaps the EPA isn't inten tionally harming the Hudson. But it is institutionally wed to its own huge dredging project and fears the repercussions if it makes a candid assessment and considers alternative approaches. Some blithely dismiss concerns about dredging because "GE is paying for it," but they miss the point. GE may be writing the checks. The Hudson and the people who live near it are paying the price. Sharon Ruggi is a former president of the National Association of Resource Conservation and Development Councils and a member of the environmental group Citizen Environmentalists Against Sludge Encapsulation. The next phase of Hudson River dredging could take seven years or more, longer than past estimates of as little as five years, the federal Environmental Protection Agency said Friday. The agency made the statement in a response to a draft report from an independent panel reviewing last year’s PCB dredging along the upper river. The peer review panel said this month that it could take more than five years to perform the job well. The EPA said it agrees that so-called Phase 2 dredging, which represents about 90 percent of the cleanup, would likely require more time than had been estimated earlier. The timeframe depends on the amount of contaminants found on the river bottom and how quickly they can be removed, said Walter Mugdan, the EPA’s regional Superfund director. He said the agency was “cautiously optimistic” crews could keep a good pace. The peer review panel’s draft report called for substantial changes in the Superfund project before crews embark on Phase 2. The EPA has said it wanted to restart work next year. In its comments to the panel, General Electric proposed dredging in 2011 that focuses on the areas left unfinished in the test phase last year. The company said results of that dredging could be analyzed and used to set standards for Phase 2. GE plants in Fort Edward and neighboring Hudson Falls discharged wastewater containing PCBs before the lubricant and coolant was banned in 1977. PCBs, or polychlorinated biphenyls, are considered probable carcinogens. The peer review panel’s final report is due Sept. 10. The EPA will consider the report when it decides this fall on how to continue with the next phase of dredging. ALBANY, N.Y. — After reviewing the initial dredging of the Hudson River that released PCBs back into the water and took longer than expected, an independent panel called for substantial changes in the Superfund project before crews embark on the major phase of cleanup. A draft report released Monday by the seven-member panel of experts said some new approaches are needed in the cleanup of a contaminated 40-mile stretch of river north of Albany, as well as changes to project standards. The Environmental Protection Agency, which is overseeing the work by Fairfield, Conn.-based General Electric Co., said it will consider the peer panel's recommendations. The agency expects to make a decision on how to continue with the next phase of dredging this fall, after the panel releases its final report by Sept. 10. "The peers have made it pretty clear ... I would even say explicit, that this project can be completed successfully with some of these changes," said Walter Mugdan, the EPA's regional Superfund director. GE plants in Fort Edward and neighboring Hudson Falls discharged wastewater containing PCBs before the lubricant and coolant was banned in 1977. PCBs, or polychlorinated biphenyls, are considered probable carcinogens. The EPA called for the river cleanup in 2002 under federal Superfund law. Last year, the independent panel studied results of PCB dredging along a six-mile stretch of river north of Albany to see what changes are needed before barges and dredges return for the second phase of work. The "Phase 2" dredging would represent about 90 percent of the cleanup and could take five years. The EPA wants to restart work next year. Dredge crews hired by GE last year found greater concentrations of PCBs than expected and only 10 of 18 areas targeted for dredging in the Fort Edward area were completed. PCBs also were kicked up into the water at a level higher than desired. The panel's draft report called for "substantive changes" to standards that govern the project, including the pace of work, levels of PCBs that dredgers stir up and resuspend into the river, and how much contamination is left behind. The panel called for covering dredged areas quickly to minimize PCB resuspension and for collecting better mapping information to guide how deep to dredge into sediment. It also called for more flexibility in doing the work, such as dropping the five-year Phase 2 timetable to make sure the dredging is being done well. The EPA and GE this year presented different proposals to the panel on how to continue with the dredging. The EPA largely called for engineering changes. But GE, which says it has already spent about $561 million on the project, proposed setting a cap on the amount of PCBs that would be allowed to flow downstream during the next phase. The panel panned the proposals from both GE and EPA. GE spokesman Mark Behan said the company agreed with the panel's concern about resuspension, that additional data should be collected and analyzed, and that a computer model should be developed by EPA and GE to guide decisions about dredging. "We look forward to working with EPA to determine how best to apply the recommendations of the peer reviewers to improve the dredging project," Behan said. The panel conducted its review as part of the Superfund process and is comprised of experts in environmental cleanups employed by private environmental consultants and the U.S. Army Corps of Engineers. A panel of scientists evaluating Hudson River dredging on Tuesday heard clashing ideas from General Electric Co. and federal regulators on the best way to continue the massive cleanup. The panel is studying results of last year's test dredging at PCB "hot spots" on the river about 40 miles north of Albany. The panel will make recommendations this summer for the second phase of the dredging, a project that the U.S. Environmental Protection Agency wants to start next year. Last year's dredging took longer than expected, mostly because the contamination of the riverbed was deeper than expected. PCBs also were kicked up into the water at a level that was higher than desired. The EPA and GE now have far different ideas about how to solve the problem of PCBs released into the river during dredging. EPA project manager Ben Conetta believes the problem is manageable. The agency is calling for engineering changes, like taking bigger bites with dredge buckets and surrounding dredge areas with surface-to-riverbed "silt curtains." Officials from Fairfield. Conn.-based GE say that continuing the dredging poses the risk of contaminating the river with higher levels of PCBs for decades. "You defeat the fundamental objective of the remedy," said Ann Klee, GE's vice president for corporate environmental programs. The company instead proposes setting a cap on the amount of PCBs that would be allowed to flow downstream during the next phase. Crews would start by targeting the contaminated areas that otherwise would be most likely to pollute fish downriver. The cleanup would stop if the cap was hit. GE, which estimates that it has already spent $561 million on the project, also wants to limit the next phase to five years. PCBs, or polychlorinated biphenyls, are considered probable carcinogens. GE plants in Fort Edward and Hudson Falls discharged wastewater containing PCBs for decades before the lubricant and coolant was banned in 1977. EPA and GE disagree not only on how to proceed, but on many of the figures and models they are basing their recommendations on. Conetta said GE was proposing a partial remedy and that the company's interpretation of the dredging data was "overreaching." "The long-term benefits of the remedy far outweigh those short-term impacts," he said. The panel of scientists will study the sometimes conflicting data over the next three days in this Hudson River city as they work on their draft report due June 30. GE could decide not to perform the next phase, though the EPA could continue the work and recoup costs from the company. 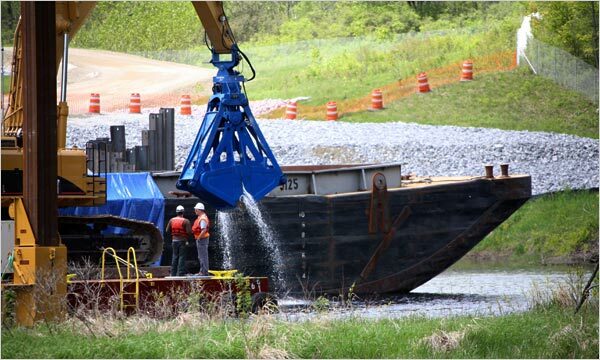 Phase I of the largest PCB dredging project ever undertaken began this past year on the Hudson River at Fort Edward. It went badly, with dredging completed in just over half of its planned area, and with discovery of a previously unknown, deeper layer of PCB-tainted sediments that threatens to extend the planned six-year project for years longer. Just how badly it went is a little-known fact, though hints may be gleaned from two new draft reports prepared by the U.S. Environmental Protection Agency (EPA) and General Electric Company (GE) to evaluate Phase I. GE reported that dredging mobilized nearly 25 times the expected amount of PCB-tainted sediments… but even that is probably just the tip of the iceberg. The beginning of dredging evoked reactions ranging from celebration about the prospect of an eventually-clean Hudson to concern about health effects, water pollution, noise and diminished recreational river use. Phase I included the drama of PCB levels in water and air creeping upward, and eventually exceeding EPA limits, forcing GE to halt dredging on multiple occasions. The EPA Hudson River Office deserves credit for trying to balance conflicting imperatives forced upon it: to dredge, but to maintain acceptable dredging conditions. The office also was forthright in disclosing problems, and willing to share technical data. –As a result, the preponderance of dredge-disrupted sediment was mobilized rather than placed into waiting barges (I estimate 75 percent was mobilized by standard five-cubic-yard capacity dredge buckets; smaller buckets, though, also were used, in sensitive areas usually near shore). These impacts went largely unrecorded and unquantified because dredging impacts in air and water were monitored inadequately in the 90 acres of river included within Phase 1. The Phase 1 area was divided into 18 work units, with just a single dredge platform in each, and no more than 12 platforms — usually fewer — active at any time. Of critical importance were measurement of waterborne and airborne PCB levels, and employees’ personal exposure to airborne PCBs. All of these were measured inadequately if at all. As waterborne PCBs are the primary source of airborne PCBs over the river, waterborne PCBs should have been measured where dredging occurred — but this was not done. Instead of sampling water in the Phase 1 area near Rogers Island, water was sampled about five miles downstream. Thus waterborne PCB concentrations at dredging sites were anyone’s guess, determined by the also-unmeasured dilution factor that occurs as dredge-mobilized material travels five miles downstream. Similarly, airborne PCB concentrations at dredge sites were anyone’s guess, because airborne PCBs were not routinely measured at dredging platforms. EPA assured me that GE had generated 243 air samples via monitors worn by employees. With 500 employees engaged for the project, however, over 30,000 samples would have been expected. Still, the 243 samples might have been useful to indicate airborne PCB concentrations, except that the monitors that were used had very high (occupational) detection thresholds and EPA was unable to indicate whether any of the 243 samples originated from the dredging corridor (as opposed to the treatment facility). My photographs of employees on a dredge platform revealed no personal air samplers. Airborne PCBs were monitored by portable air samplers adjacent to dredge platforms, on opposite shores of the river. These samplers recorded 24-hour average airborne PCB concentrations, but three problems undermined their usefulness. First, leaking dredge buckets produced PCB-tainted sprays that employees could inhale, that dropped back to the river surface before reaching onshore monitors. Second, monitors collected air samples from all directions, massively diluting air coming from the particular direction of a dredge platform, so onshore monitors failed to capture actual airborne PCB levels over the water. Each portable air monitor also was moved downstream with its neighboring dredge platform. No monitors remained to record evolving airborne PCB levels at any dredged location. Indeed, as the area of dredged river increased to its maximum, the concentration of airborne monitors per acre of dredged river declined, because no monitors were added to cover the increased area of dredge river. Hence, the third problem: PCB entry into the air probably will reach steady rates long after portable air monitors were withdrawn downstream along with dredge platforms. Indeed, PCB release from the river surface probably would not reach steady rates until long after Phase I was completed. By then, portable monitors will have been withdrawn, not only downstream but altogether, in what I call ‘hit-and-run dredging’. –Dredging has turned exposed people into experimental subjects, and riverfront communities into the subjects of epidemiology studies that will continue for generations to come. –Dredging Project Phase I evaluation, aimed only at improving dredging in Phase II, also should consider termination of the project. FORT EDWARD -- Dredging of PCB-laden sediment has been halted on two spots of the Hudson River after a survey found heightened levels of the chemical at Thompson Island Dam. Tests conducted over a 24-hour period between Thursday and Friday found the level of polychlorinated biphenyls to be about 526 parts per trillion, the U.S. Environmental Protection Agency announced late Friday. The federal safety standard for water is 500 parts per trillion. A test showing the chemical level over the threshold triggers a temporary shutdown of dredging in some areas. Dredging was shut down at the southern tip of Rogers Island in Fort Edward and about 2 miles south of the island. Work on the Hudson River continues in other parts of the river, said Mark Behan, of Behan Communications and a spokesman for General Electric Co., the company that is funding the cleanup. Additional water samples were taken on Saturday at the dam. Behan said later Saturday that the tests found the PCB level to be lower. Work was planned to continue on the rest of dredging area of the river, he said. Dredging is not conducted on Sundays. Concerns over drinking water were raised before the project started, with officials in Halfmoon and Waterford arguing last year that an alternate water source is needed before the project could start. The fear was that dredging could disperse more of the chemical downstream. Residents in those communities now receive service from an alternative water source if tests find the level of PCBs to be more than 500 parts per trillion in river water. Behan said officials in those towns were contacted by 4 p.m. Friday about PCBs exceeding the federal safety level. EPA spokesman Michael McGowan wrote in an e-mail that the towns of Waterford and Halfmoon were notified in time to trigger an alternate water supply from Troy. The long-delayed Fort Edward-based project to dredge the Hudson River sediment contaminated with PCBs, a chemical discharged by GE until the 1970s, started on May 15. This is the third time since the cleanup started that work was disrupted by heightened levels of PCBs in the river. In August, tests found PCBs crossed the 500 parts per trillion threshold twice — once on Aug. 1 and again on Aug. 7. Dredging resumed the following week. At the time, EPA officials said the cleanup method was being adjusted to prevent further PCB dispersal down river. Read more about this issue in The Post-Star on Sunday and online at www.poststar.com. Less than three months after EPA’s much-delayed and highly controversial plan to dredge the Hudson River to remove PCBs got underway, the agency’s own monitoring devices show levels of the chemical are rising, not falling. The findings cast further doubt on a project that is already more than five years behind schedule and $320 million over budget. Eleven dredging machines, 18 barges, and 18 tugboats are currently at work along a six-mile stretch of the Hudson. Ultimately, EPA’s plan calls for the removal of more than two million cubic yards of PCB-laden sediment, to be deposited in giant landfills in west Texas. In late July, levels of PCBs (polychlorinated biphenyls) along a stretch of the river about 35 miles north of Albany had risen to 442 parts per trillion (ppt), only slightly below the 500 ppt threshold EPA said would require shutting the project down. By August 7 the level had risen to 540 ppt. EPA’s dredging guidelines stipulate that if PCB levels exceed 500 ppt twice, the agency will have to order a temporary halt to dredging operations. Agency officials scrambled to assure skeptical local residents the spike in PCB levels posed no threat to public health, and EPA announced it would modify its dredging procedures in the hope of reducing contamination to air and water. The news that EPA’s cleanup of the Hudson is actually contaminating local air and water is but the latest chapter in the long debate over what, if anything, the federal government should do about trace PCB amounts in the river. Two General Electric capacitor plants legally released PCBs into the Hudson from 1947 to 1977. PCBs were used widely in electrical equipment because of their insulating properties, until Congress banned the use of the chemical compounds in 1976. The congressional action came on the heels of a landmark study by Renate Kimbrough, then with the Centers for Disease Control and Prevention, who found laboratory rats fed huge amounts of PCBs developed liver cancer. Nearly a quarter of a century after publishing her initial findings, Kimbrough revisited the subject in a March 1999 peer-reviewed study in the Journal of Occupational and Environmental Medicine. In that study, Kimbrough and epidemiologist Martha Doemland found no association between actual human exposure to PCBs and death from cancer or any other disease. Their study focused on more than 7,000 people who worked from 1946 to 1977 in the exact GE plants on the Hudson where the PCBs were released into the river. It found GE workers were less likely to die of cancer than expected in a statistically similar group of people, both in the region and nationwide. Ignoring the evidence the gradually decomposing PCBs at the bottom of the Hudson River posed no threat to public health, the Clinton administration began considering removing the chemicals via a vast dredging project. Clinton EPA Administrator Carol Browner, now the White House energy and environment czar, recommended the project shortly before leaving office in January 2001. Her successor at EPA, Christine Todd Whitman, gave the green light to the project in December 2001, effectively turning the upper Hudson River into a giant Superfund site. As originally conceived, dredging was to get underway in 2003 or 2004, last for an undetermined number of years, and cost $460 million. Dredging didn’t get started until May 2009, however, and the price tag, to be paid by GE, is currently forecast at $780 million and is still rising. Before EPA mandated the PCB removal, critics warned the agency was vastly underestimating both the cost of the project and the difficulty of containing the PCBs once the dredging got underway. They pointed out PCB levels in the upper Hudson had been falling for years as the contaminants became entombed under successive levels of sediment on the river’s bottom. Dredging, they pointed out, would stir up the chemicals, creating the very problem EPA’s dredging scheme was supposed to solve. One of those issuing such warnings was Tim Havens, president of Citizen Environmentalists Against Sludge Encapsulation (CEASE), a local group opposed to dredging. Havens says he’s disappointed EPA failed to listen to him and other critics of the project earlier this decade. The dredging is slated to last for several years, with a target completion date of 2015. Bonner R. Cohen, Ph.D. (bonnercohen@comcast.net) is a senior fellow at the National Center for Public Policy Research in Washington, DC.